Rather late in the morning I jumped on Bad Boy and rode along the Tsurumigawa river and the Onekan road to Hashimoto and Tsukui lake. Riding Bad Boy is rather a slow affair, it took me 1:09 hours to the Onekan crossing while I can do it in less than an hour on good days on the Cervelo. 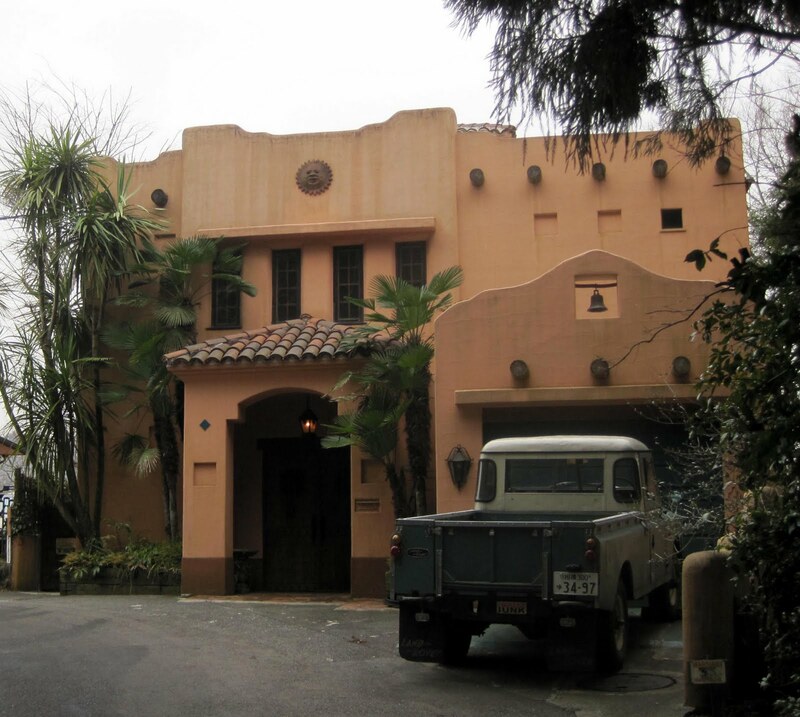 As I was slow and not chasing speed records, I had time to take some long overdue photos, like the „House of the hanged foils“ and the residence of the Columbian druglord along the Tsukui lake North road. I went along Doshi to the Yamazaki shop at the entrance to Miyagase-lake and Yabitsu and I was surprised to see there many typical cycling related food like Weider Jelly, Soy Joy etc.. Clearly there must be more cyclists on the road and the shops are adopting accordingly. After a very short break I continued to ride to Miyagase lake and then started to climb Yabitsu Toge. There was some snow left and right of the road from elevation 300 meters upwards but not too much. Instead it started to drizzle, not too hard but not very pleasantly as well. The road was completely deserted for (normal) cars. I didn’t encountered a single bike or (normal) car when riding up. However: There were five construction sites on the road up and all of them did slope works. More concrete out there. And of course a lot of construction related trucks and concrete mixers. Whereas I thought last year, that the fury of public works might be related to the change of the govt in Japan, I am not sure if the change in gov’&t has changed anything at all in this respect. Or do I need to wait for the end of the fiscal year in April? At least Yabitsu was not closed for traffic in the winter like some of the years before. It took me more than an hour to get to the top. Bad Boy is not only slower in the flats by 10 – 15%, but also climbing is slower in the range of 15 – 20%. Bad Boy is pretty heavy and the 700 x 30 tires add rolling resistance as well. On the top there was no Snow on the road, foggy views, drizzling rain and 5 degrees Celsius. I felt a little bit dizzy, the rider came out of the cabin and the usual dialog started: „Daijobu? daijobu? Daijobu? Heiki?“ Ellow and leg really hurt but basically I felt OK and I told him that I would just need a little break and then continue to ride to Hadano. 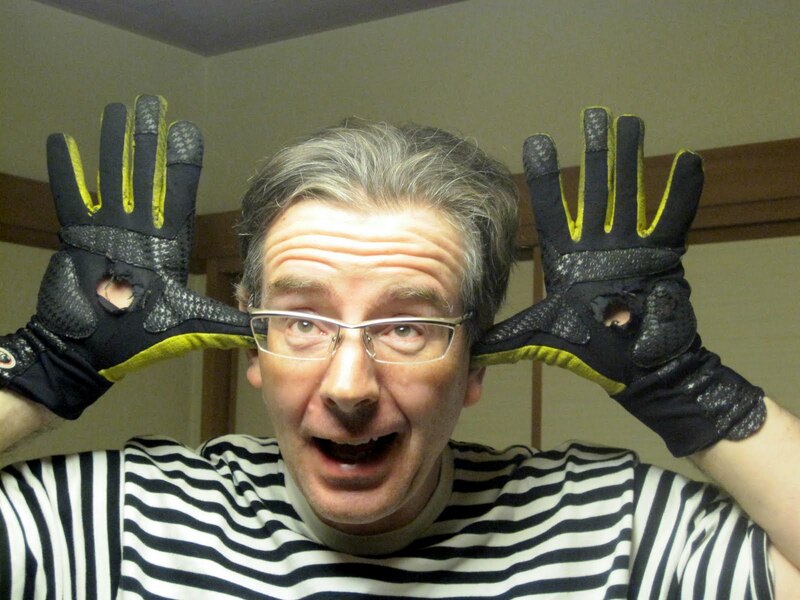 My jacket and long trousers were also not torn despite the pain, however my Assos winter gloves had big holes in the area of the palm on both hands. After a few minutes and checking that Bad Boy was still in acceptable shape, I continued the ride down very slowly and made my way up to Hadano station. Took the train home. Finally at home I could undress and take a better look at the damage done. Nasty scratch, that will hurt for some days. Surprisingly swollen as well. Took a long nap. Took it easy. So, not sure about the Saturday Izu ride. Let’s see. Be careful out there. There was no indication of ice and I haven’t seen any on the road riding up. Good news. 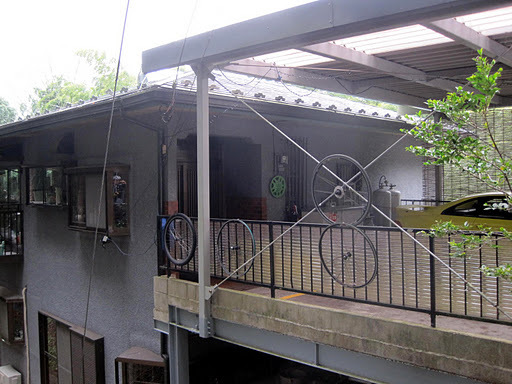 I happened to look at the Nalshima Frend website today, and was delighted to see that there is now a choice besides Y’s Garage to stop for gear and repairs along the Tamagawa. Since last November … when I stopped riding temporarily, so maybe I am the last to know this „news“ … Nalshima is no longer up by Tachikawa Station, a 5-10 minute detour through unpleasant crowds. It is under the monorail, down near the river. See the website for a map.